The road to success is very unique. Not all people stand on its path to look and walk forward, not all people continue the journey without stepping back and accepting failure in a walk towards more promising avenues. Something which I happen to see in people on a run is loneliness. They drift apart from the world; choose a path which leads them with high potential. After sometime, they stop a bit and look all sides only to find that they are running alone and all those who seemed to be following or walking by the side just vanished. A break down or down fall then starts. Desire for success falls apart and craving for the near and dear ones creeps in. the run turns slow, looking back and searching for hands which can pat the back. Lack of encouragement, love and self confidence rips off the success goer’s attitude. The envisioned future starts to appear blurred and a craving to return to the roads you left leaves you confused and stirred up. Is it loneliness? Is it a left over feeling? Does it happen? It is a big “YES” in answer to all these questions. For me, it’s damn necessary to experience loneliness. Go through that rough phase. It tests your every ability to the core. This is the chance to unleash the hidden fears and feelings. Go through that horrible phase. The resonance of loneliness hits hard. The desire to be encouraged, loved, praised digs your esteem to the roots. The joy of success wishes for people to celebrate. You will feel that you deserve to be praised or looked high. Your success should be spoken about by every one. The unconditional gear you set up before the walk slowly fades away. Irrespective of the rules you set, you think of going back. The cracks deepen along the walls of self confidence. It’s sometimes too abstract that you don’t even realize what is happening inside, but at the end of the day, you find yourself serving a weakness hailing from deep within. Let it reach you and stiffen the movements. Let it try to block every way in every possible way. Now test your will power. Test the skills. Test the reverence you’ve been stick to till now. Test every step since the journey began. Jot them down on your scribble pad. Catch hold of the diminishing spark and question it! This may sound funny. But it actually works. Ask it the reason. Ask it for the logic. Then the spark is going to answer all the answers. Those answers are sure to throw your own weaknesses and fears before your eyes. But don’t get collapsed. Analyze the answers. Imagine your esteem without those ruthless fears and weaknesses. Try to strategize the situation and see. Focus on the assets called your strengths and grip them. There is always a choice when it comes to justice. You can do it right or deny the truth and go for doing wrong. The choice decides the future. Early birds rise to the skies and lazy ones keep dreaming in the nest. Modesty, when germinates in your living, everything becomes easy. Then a new seed germinates within. The so called magnanimous “SOLITUDE”. It doesn’t have weaknesses to cling to its feathers. It’s a bird of eternal peace within the soul. Breed it and see the fabulous change! It is silent. It is calm. It feeds you the unending tonic of “tranquility”. It wins every war inside. Gives you ammunition to fight against all odds outside. 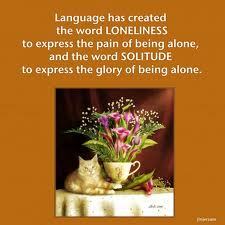 People, who have experienced loneliness and have switched to solitude, will certainly know its value. It gives strength. It gives courage. Most important thing is that, it doesn’t let you crave! Grants you the boon to trust yourself. Kindles the hope and keeps it enflamed. Sit back every day for half an hour or so and spend with yourself. Concentrate on your soul, its needs. Love yourself from deep within. Provide the energy necessary to recharge. Do something that you can enjoy. Write what you feel. Projecting few lines of your feelings is a way out to vent the inner emotions. This clears the mind. Solitude shines as a jewel in the crown of success. Other gems and jewels on the crown get the shining from this very own solitude. So, what is the energizing system you have in your life factory? Loneliness or solitude? Question and get answers heard from within. The beauty of the outer world is reflected by the inner peace you pamper. Convince yourself with the logic and see! Valid reasons will startle you. The evidences which ripped you apart from the goal will show the necessity of solitude. Unfathomable predictions will lose their entity. The dispassionate living shadowed by loneliness gets displaced by the passionate trends when solitude is invited. Is it easy to just invite solitude and seat it within, when you are suffering from loneliness? It will seem very difficult. Victimized by loneliness, a person can’t just switch to other tune of living so easily. If it was so easy, people would never suffer then! Right?! But once you start loving yourself and building self esteem, you’ll come to know that you are not alone. You are an entity of a flame which keeps lighting the darkness. The mystic nature of self renaissance works here. This formula leads the rest of the life. Once success is just a journey for you, you will keep taking leaps. Once you start involving others in the journey and start giving credits to them, the world will follow you. Solitude teaches you the principles of life. To see within reveals the mistakes you make. It enhances your capability to work on the problems and solve them. It frames back the disfiguring “you”. Touch its magical empathy! Sink it into the soul! Pleasant smiles are forever yours! Illusion less life will ever be yours! One who has stridden through the rough roads knows the real taste life throws! Solitude is a hymn of courage. Solitude is budded in the garden of serenity which wins over the world. Let the pangs of loneliness vanish! Nurture this tender yet strong “SOLITUDE” embrace your life!! !